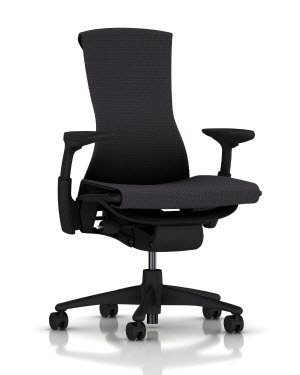 Herman Miller is known as the creme de la creme of ergonomic office chairs. In this article we offer a complete comparison and buyer's guide to help you choose between the Herman Miller Aeron and the Herman Miller Embody office chairs. If you work at a desk for a living, investing in the best desk chair is worth every penny, and in this side-by-side Embody vs Aeron showdown, you'll get a good sense for which chair will work best for you, and why. A complete breakdown of the size of these chairs and information about choosing the best ergonomic chair for your body type is available lower on this page. In 1994, Herman Miller designers Bill Stumpf and Don Chadwick created a chair that was environmentally sensitive, good for your health, inclusively sized, and ergonomically sound. The Aeron chair they created has provided thousands with a comfortable, ergonomic chair which does not use foam, fabric, or leather. The re-mastered Aeron chair of today incorporates the latest science, materials, and manufacturing methods in an iconic chair for the way we work today. The core problem which Herman Miller's design team wanted to solve with the Embody chair was that technology has made us disconnected from our bodies. We spend so much time interacting with computers, smartphones, tablets, and all of our wonderful tech with just our fingers, which can make us feel stiff and tired. Our bodies are made to move, and with Embody, the chair designers Bill Stumpf and Jeff Weber have created a product which allows us to do just that. Herman Miller's product videos do a nice job of highlighting the design principles and features of each of these chairs. Here are the official videos of both the Aeron and the Embody chairs so you can get a better feel for what makes them unique. 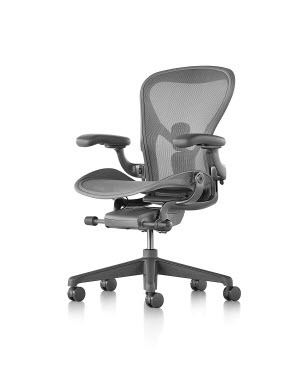 The game-changing and iconic Aeron chair, developed in 1994 changed the way we think about office seating, and the updated version that Herman Miller manufactures today incorporates the latest research into ergonomics and advances in manufacturing to produce one of the best office chairs you can invest in for your health and comfort. Twenty physicians and PhDs specializing in biomechanics, vision, physical therapy, and ergonomics were involved in the development of Herman Miller's Embody chair, making it the benchmark against which all other chairs are measured in terms of pressure distribution, spine alignment, and support for healthy movement in ergonomic seating. Embody vs Aeron: Which Chair is Right For You? These are both excellent chairs. ​I'm partial to the Embody because I prefer the unique design of this more recent Herman Miller office chair, and I'm also a larger person at 6'2" tall. The Embody chair is designed specifically to reduce stress (something we can all benefit from), and it actually has been proven to lower your heart rate while you're sitting in it. The "dynamic matrix of pixels" (their words, not mine) of the chair's support framework was designed to stimulate blood and oxygen flow throughout your back, posterior, and shoulders by reducing seated pressure. I loved sitting in it. While both chairs are highly adjustable, I find that many office workers don't necessarily know how to adjust their office chair properly. This is one reason why I'm partial to the design of the Embody ... it takes less time and energy to "dial in" the ergonomics and alignment of the chair to make it perfect for your body. It will be an improvement over your current chair right out of the box. Don't get me wrong - either chair can be fine-tuned to offer near-perfect seated ergonomics (just be sure you order the right size of the Aeron ... more on that below), but I found the Embody to be easier to get "just right." The Lumbar Support adjusts up and down on the back of the chair in addition to adjusting in firmness (the Embody only allows you to adjust the firmness of its lumbar support). The armrests can be tilted inwards and will adjust horizontally (the Embody armrests can only tilt outwards and do not adjust horizontally). Both chairs have armrests which can be adjusted up and down. You can order an optional headrest to add to the Aeron office chair (the Embody does not come with one since it has a higher back). In general, the Aeron should work really well for everyone in terms of its ergonomics. The Embody should be ergonomically appropriate for everyone except the most petite people, who will be comfortable in the Embody, but may be more comfortable in the Aeron size A chair. For a side-by-side comparison of the Embody and Aeron chairs in terms of height, seat height, width, and depth, use our ergonomic chair height calculator, and then take a moment to consider the table with product specs at the top of this page. The Aeron from Herman Miller comes in several different sizes, these include A, B, and C.
Size A is designed specifically for smaller people, and will provide optimal ergonomic support for individuals up to 5 feet 2 inches tall and 130 pounds in weight. Size B is designed for individuals between 5 feet 3 inches and 6 feet 6 inches in height, and can support people who weigh anywhere from 140 to 300 pounds. Size C is designed for the largest individuals, and is the better choice if you fall at the large end of the Size B range, or above. Below, you'll find the complete sizing chart from the Herman Miller website, which makes it easy to decide which size Aeron chair will be perfect for you based on your height and weight. One final note I should make about purchasing your Aeron chair on Amazon -- you will notice a discrepancy in price between the "Classic" Aeron chair (less expensive) and the newer model Aeron chair. The price difference can be a few hundred dollars. ​I've found that some of the "Classic" chairs are refurbished, which is part of the reason for the price discrepancy, and you may not be getting a new chair if you go with the lower-priced model. These chairs may still be excellent and exactly what you want/need, but I felt it was worth pointing out why there is this pricing discrepancy for Aeron office chairs. In my experience most people buying an office chair at this price-point expect to get a new product. The unique design of the Herman Miller Embody chair allows people of nearly any size to be comfortable and to enjoy an ergonomic position with some adjustments to the chair height and positioning. Very large people (taller than 6 feet, 6 inches) may want to invest in the extended Embody model instead, but everyone else, even very short people, should be comfortable in an Embody chair from Herman Miller. There is no posted weight capacity for the Embody chair, though 300 pounds is the recommended limit. This chair is very well constructed, and should be able to support individuals who weigh between 300 and 400 pounds without much trouble in my view. These short videos from the manufacture will help you learn how to adjust the Aeron or Embody office chairs to be perfectly tuned to your body. The Price of Herman Miller Chairs: Are They Really Worth The Money? There is no getting around it -- Herman Miller makes expensive chairs, and if you compare the Aeron with the lower-quality $100 knock-offs you'll see in any office furniture store on a price-tag basis, you'll certainly balk at how expensive these chairs are. If you have the means to invest in a high-quality office chair like the Embody or Aeron from Herman Miller, do so. Your back, your rear-end, your neck, and your shoulders will thank you for it. ​A low-quality imitator will not last, and it will not provide the features that have made these chairs titans in the ergonomic office chair marketplace. ​Both of these Herman Miller desk chairs are an investment in your health, your productivity, and your comfort. If you work a 50 hour week at a desk, nearly 30% of your working life is spent in a desk chair. Do you really want to cut corners or skimp on quality for something that is such a big part of your life? I know I don't. The way I put the purchase of an office chair into perspective is like this: every day, people spend $1,000+ dollars on high quality mattresses that will support their spine and allow them to wake up pain free. The fact is that if you work a desk job, you are likely spending the same amount of time sitting in your desk chair that you do asleep on your mattress. Your body deserves to be supported and nurtured in both places so that you can be at your best and healthy for years to come. One final thought on the price tag of Herman Miller office chairs: many businesses and work-from-home professionals can write-off the cost of these chairs as a business expense, making the investment a pretty smart business decision for most people if you keep the receipt. If you are looking for a high-quality office chair, but the Embody or Aeron are just out of reach for your budget, I can recommend either the Leap model (Aeron Alternative) or the Gesture model (Embody Alternative) from Steelcase as direct competitors that can be purchased at a slightly reduced price. Both of these chairs are high-quality, and while I prefer the Herman Miller chairs, Steelcase makes a high-quality office chair that most people shopping in this price-range will love. They tend to be priced a few hundred dollars cheaper. Love What You've Seen So Far at 10Desks.com? Read More of Our Product Buying Guides or visit our site's main menu to review some of our "Top 10" lists of office desks in every style.